Two more impressive culinary resumés you will hardly find in a pair than Kim Floresca‘s and Daniel Ryan‘s. (It’d also be a challenge to find two more lovely and generous people.) 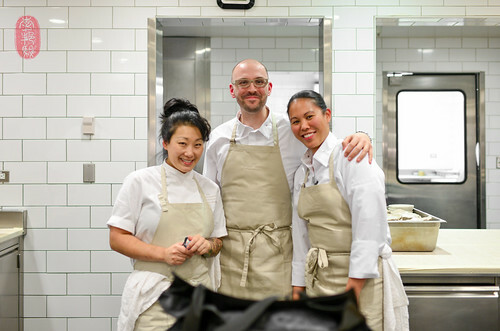 Between the two of them, they’ve worked at The French Laundry, Alinea, per se, Alain Ducasse NY, and Eleven Madison Park; and together, they worked at el Bulli, Mugaritz, and, most recently, The Restaurant at Meadowood, where she was executive sous chef and he was the pastry chef. That last stop is where I met the couple four years ago, at the Twelve Days of Christmas. Since then, the two have left Napa to head their own kitchen and restaurant on the other side of the country. Floresca and Ryan are now cooking at [one] in Chapel Hill, North Carolina, where I had the opportunity to eat in 2013. Sadly, I had not seen them since then. 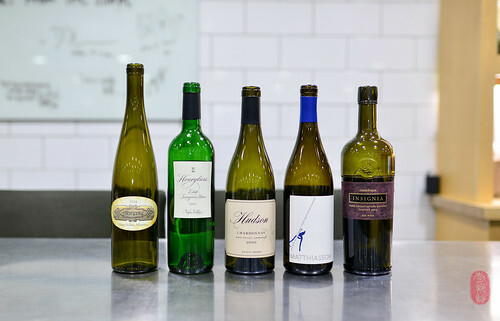 So, I was particularly happy when I learned that Christopher Kostow was calling them home to Meadowood Napa Valley for a reunion on the seventh night of this year’s Twelve Days of Christmas. 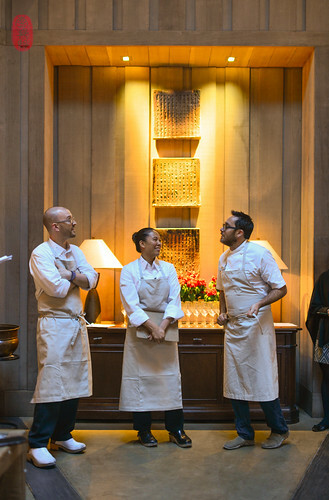 Unlike many of their peers, both Floresca and Ryan have a solid background in classical cooking, as well as a legitimate stake at the frontier of modernest cuisine. 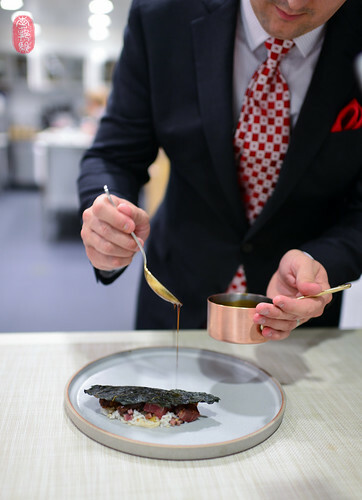 You’ll find this duality reflected in their cooking, which uses traditional techniques to leverage creative, out-of-the-box thinking. They’ll take familiar classics, and make them anew, unexpected. Dutch stroopwafels, for example, they filled with creamy foie gras instead of caramel (which I never liked anyway, because it always sticks to my teeth). They also used foie gras to make the dough for their version of the Fig Newton. The filling was made from figs and black truffles. It was rich. It was great. Both of these were served as canapés. Sometimes, their food reminds you of other things, and yet are entirely different. Their potato dumplings, for example, were boiled first before frying, giving them a distinctly pretzel-like chew. These dumplings were split in half and topped with crème fraîche and caviar. You’ve seen all of these ingredients together before, but not quite like this. Daniel Ryan’s desserts are just as creative. His version of “red velvet” at this dinner included adzuki beans, peanuts, and clabbered milk. It was red. And it was velvety. But that’s about all it had in common with the more familiar dessert by the same name. Unexpected, but delicious was the theme of this dinner. Kostow presented silky spot prawns with their “shells,” which were actually house-made prawn crackers. They were ultra-crispy and packed a lot of flavor. They were terrific. Floresca and Ryan presented roasted rutabaga, carved into perfect spheres, coated in a milky “butterscotch” sauce, described to me as caramelized lactose. They also served broccoli dumplings – like gnudi, but firmer – on a bed of field peas that had been fried until crispy and mixed with spices associated with the everything bagel (poppy seeds, sesame seeds, dried onion, and dried garlic). That was great too. 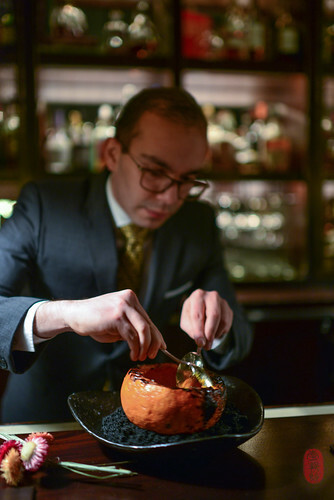 Kostow roasted beautiful pumpkins over the coals and presented them table side. The hot, steaming flesh was scooped from the gourds and spooned over bowls of black tea jelly and sheep’s milk yogurt. Kostow also revived one of my favorite dishes from The Restaurant at Meadowood. 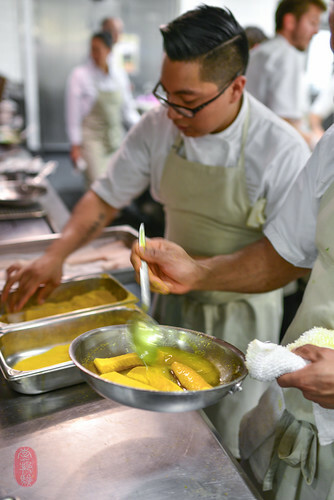 He coated strips of black cod with a powder of dried sunflower petals, and then basted them with hot oil until they were buttery and glowing-yellow. He served the fish with a piece of pickled sunflower choke (from the blossom, not the root) and a creamy dollop of sunflower seed butter. I love this dish. One of the most visually stunning and unique desserts I’ve had at The Restaurant at Meadowood was served this night. It was, simply, a scoop of lily bulb ice cream topped with candied lily petals that were so thin and crispy, they shattered with a light tap of the spoon. It was like eating Frosted Flakes cereal with ice cream, but with a faint, lily fragrance. This was beautiful. Below, you’ll find the menu from the seventh night of the Twelve Days of Christmas featuring Kim Floresca and Daniel Ryan. To see all of the photos from this dinner, CLICK HERE. Watermelon radish, oxalis, crème fraîche. Fig, foie gras, black truffle. Black tea jelly, sheep’s milk yogurt. Carolina gold rice, moorish kale. Lily bulb ice cream, candied lily petals. Adzuki bean, peanut, clabbered milk. 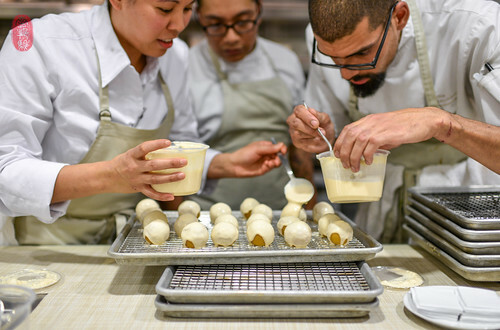 Photos: Coating balls of rutabaga with “butterscotch” made of caramelized lactose; Daniel Ryan, Kim Floresca, and Christopher Kostow at line-up; venison tartare with watermelon radish, oxalis, and crème fraîche; Frederico MacMaster scooping out coal-roasted pumpkin table-side; Nathaniel Dorn saucing Border Springs Farm lamb best ends and bits; basting black cod with hot sunflower-infused oil; the wine pairings; current executive sous chef Katianna Hong with former pastry chef Daniel Ryan and former executive sous chef Kim Floresca. ~ by ulterior epicure on December 25, 2015.